Isabel is a freelance Scenic and Costume Designer. Having made Atlantaher artistic home, she, along with her design partner and twin sister Moriah, have designed for professional theatres across the country from New Orleansto Maine. In addition to Theatrical Outfit, their work has been seen around town at Horizon Theatre, Kenny Leon’s True Colors Theatre, Actor’s Express, AuroraTheatre, Theatre in the Square and Atlanta Lyric Theatre. They are multiple nominees and two time recipients of the Suzi Bass Awards; one for their 2011 Scenic Design of Avenue Q at Horizon Theatre and one for their 2011 Costume Design of The Mikado at Atlanta Lyric. 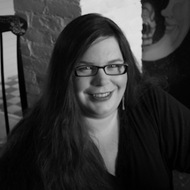 Isabel holds a BA from NYU and a MFA in Theatrical Design fromBrandeisUniversity. She is honored to be considered an Artistic Associate at Theatrical Outfit.